Virginia joined the Union in June of 1788. Of the 13 original colonies, Virginia likely had the greatest historical influence on our fledgling democracy. Specifically, four out of the five Founding Fathers who comprised America’s first generation of U.S. presidents—Washington, Jefferson, Madison and Monroe—were born there. Is it any wonder why this state’s tourism slogan is “Virginia is for Lovers”? Certainly, over the years, what state has been more purely or proudly American? In this tumultuous age, pro-America means Republicanism. To that end, Virginia had dependably voted that way from 1952 to 2004. The one exception in that longstanding trend is understandable. It was the re-election of the first modern progressive, LBJ, in 1964. Recall, Virginians didn’t vote for John Kennedy in 1960. Yet, with the entire nation still emotionally shattered by his assassination, they chose his vice president by a healthy 7.3 percent margin. In the 2016 presidential election, the reason Virginia has not yet returned to its conservative roots is troubling. In large part, this is due to current Governor Terry McAuliffe, a close Clinton political operative (the chairman of her 2008 presidential campaign, best known for fundraising). 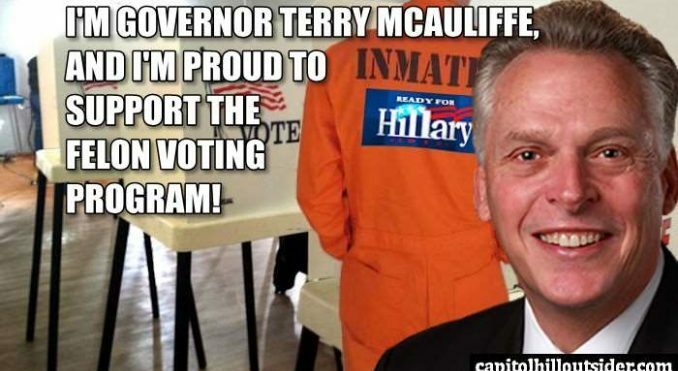 Last April, he tried to restore the voting rights of 206,000 convicts. The violent and the non-violent alike. Statistically, 7 of 10 felons identify politically as Democrats. Therefore, it’s reasonable to infer that Mr. McAuliffe played politics to aid his pal Hillary’s ultimately failed candidacy. Let’s now add to the tally of the jailbird vote. Today’s revelation is that thousands of non-citizens lurk on Virginia’s voter rolls. A telling example is Loudoun County between 2009 and 2014. Virginia Delegate Robert Marshall (R-Prince William) uncovered 9,000 juror disqualifications due to non-citizenship. This result was culled from the 350,000 residents by comparing voter registration lists and Department of Motor Vehicle driver’s license applications. Naturally, this figure is anecdotal, but it strongly suggests that voter fraud is real and ongoing in Democratic strongholds. Last year, the Public Interest Legal Foundation (PILF)—a conservative group striving to ensure the veracity of Virginia’s voter lists—began demanding election officials turn over data on non-citizens, whether they voted or not. As 80 percent of illegal ballots favor the Democrat, Gov. McAuliffe’s resistance to disclose this information is not hard to glean. By hook or by crook, it appears, Hillary Clinton won Virginia 5.4 percent or 212,300 votes. What’s unknown is how many of those votes were gained by the “alternative” methods described above. As Virginia’s state motto is Sic semper tyrannis—meaning “Thus always to tyrants”—its governor is supposed to champion the people’s will not actively subvert it. Left Whines & Lies - Trump wants your Children to Drink Dirty WaterReal Scandal With Jeff Sessions? Or Just Anger at His Confirmation?